While a third of Czechs would be inclined to make payments using their mobile phones, at present only 12% actually do. Every third client uses smart banking, which is becoming increasingly popular. Banks are optimising the number of branches and installing self-service terminals. Clients are visiting branches less and less and bank call centres are receiving fewer and fewer calls, according to the EY Consumer Banking Survey 2018. Seven out of 10 Czechs use a smartphone, which is more than use a notebook or PC. Nearly all young people (aged 18-34) use smartphones in all the surveyed countries (Czech Republic, Slovakia, Austria, Hungary, Slovenia, Croatia and Serbia). “Nowadays, when over half the population is far more open to the idea of online banking than in the past, we see tremendous room for improvement in smart banking. While three quarters of the population have smartphones, only 41% of them use smart banking. 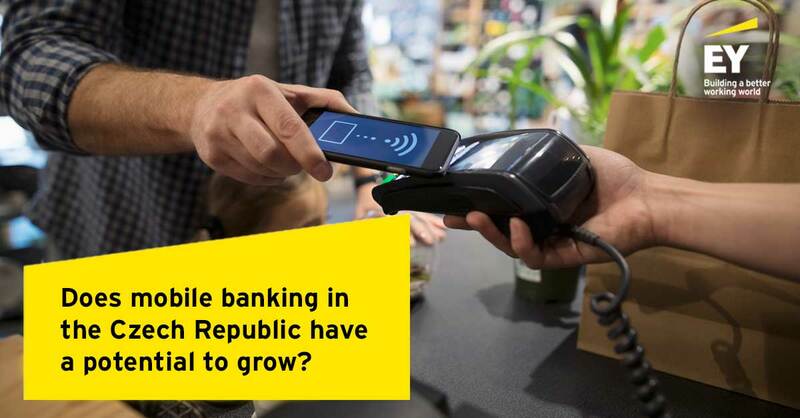 We see the greatest potential for banks in expanding the range of services via mobile banking apps and launching fintech services,”says Pavel Riegger, EY Head of Financial Services in Central Europe. Although only 41% of smartphone owners use smart banking, mobile banking has great potential for growth. In the past 12 months, its use has been on the rise; one in five of us is using it more and more. In contrast, we’re visiting bank branches less and less, and calls to bank call centres are similarly decreasing. “The time is coming when clients will no longer have any reason to drop into a branch. Banks are optimizing the number of branches and installing self-service terminals. With the gradual expansion of technologies and acquisition of digital skills, banks are trying to adapt to the smartphone app environment where they are focusing their development efforts. Banks could offer a better digital experience by providing a more expansive mobile banking environment, e.g. including e-mail services, reports or shopping, and, in so doing, creating a single platform for customers to get online,” says Riegger. Only 12% of Czechs, 14% of Slovaks, 28% of Austrians and 33% of Hungarians make payments with their mobile phones. More than a third of Czech consumers have expressed interest in smart phone payments. Although the Czech Republic dominates in the use of contactless payment cards, innovation in the area of mobile payments is lagging behind other countries. Only some banks offer the service, and then only to users of Android phones with an NFC chip. “Czechs are ready for innovation that makes their lives easier. Our banks often offer excellent services, but clients have no idea they exist. Financial institutions have to make sure customers are familiar with the services they offer. If they don’t, then clients could switch to competitors that do a better job of promoting their services. Clients must be told where the value lay in innovation, how it makes banking easier and be assured that such services are safe,” cautions Riegger.